Situated in a dominant position overlooking the river Tiber, Perugia marks the border between the lands of the Etruscans and the Umbrians. Originally a Villanovian settlement since the 9th century BC, these tribes gathered on the Colle Landone and the Colle del Sole in the 6th century BC, when Perugia became an Etruscan town. The city was a religious centre, or lucumonia, and part of the Etruscan Dodecapolis league comprising a total of twelve cities. Between the 6th and 3rd centuries BC Perugia was fortified by massive town walls in travertine blocks that followed the hilly ground around the city and are still largely visible today, particularly to the west and north. Seven gates, of which six still exist although they were partly modified by the Romans and in the Middle Ages, allowed access into town. To the west is the Arco della Mandorla in Via San Giacomo. The pointed arch we see today is Medieval, but the structure retains a post and a right side in Etruscan blocks that give an idea of the original round arch that stood here. The Porta Trasimena (also called Arco di San Luca) at the end of Via dei Priori, retains only its Etruscan piers. To the north is the main gate into the city, the Arco Etrusco (also called Arco di Augusto). Built in the 3rd century BC, the trapeze-shaped dungeons on either side make this an imposing structure. Beneath the Doric frieze there are two Latin inscriptions. The first, "AUGUSTA PERUSIA" (1st century BC) commemorates the city's reconciliation with Octavian, who had distroyed Perugia in 40 BC following a seven-month siege during the civil war against Mark Anthony. Mark Anthony's brother Lucius had taken refuge in Perugia with his army. 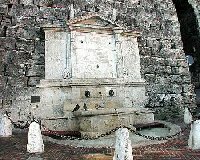 The second, "COLONIA VIBIA" (2nd century), commemorates the title of Colony assigned to Perugia by Emperor Caius Vibius Trebonianus Gallus (251-253). The loggia to the top of the left dungeon was added in the 16th century along with the fountain, creating an unusual contrast between the austere classical architecture of the gate and the lighter style that developed during the Renaissance. To the north-east, in Via Bontempi, stands the Arco dei Gigli, which still has traces of the original arch composed of a double row of arched lintels. These were replaced by a pointed arch during the Middle Ages. The same modifications were applied to the Arco di San Ercolano, on the stairs that bear the same name. Originally called Porta Cornea, this arch displays the typical pointed arch structure along with its original piers and a rounded hewn stone that recalls the formerly existing rounded arch. Still in the southern section of fortifications stands the Porta Marzia (3rd century BC). Sangallo the Younger included its facade in the eastern bastions of the Rocca Paolina, to provide a more magnificent entrance into the fortress. The rounded arch is surmounted by pilaster strips that are decorated with five figures, thought to be Jupiter, Castor and Pollux and the Dioscures looking with their horses from a balustrade made up of rhomboid shapes. This arch bears the same two Latin inscriptions that appear on the Arco Etrusco: "AUGUSTA PERUSIA" and "COLONIA VIBIA".